"My perennial plant didn't survive the winter. What happened?" I hear this every spring from a few long-time and beginner gardeners alike. So I want to address some issues that can help improve the winter survival rate of your perennial plants, especially those plants that are right on the margin of being cold hardy in your specific USDA Plant Hardiness Zone. While some perennial plants are super cold hardy others might be a little on the tender side. Too, you never know how severe any given winter will be, so it's best to be safe than sorry when it comes to winterizing your perennial garden. Keep in mind that it's important to know the winterization needs of each specific variety of perennial plant in your garden. For example, here in Georgia we wait to prune hardy Lantana until new growth begins to emerge in spring, when new leaves begin to emerge. Why? Because fall or winter pruning almost always results in death of the plant. Anyway, you're probably here reading this article because it's getting close to winter and colder temperatures are arriving. The perennial plants in your gardens are starting to go dormant, and might be looking pretty ugly, but you're worried what low temperatures the coming winter will bring and if some of your perennials will survive it. So, what to do? Should the ugly dead foliage be cut back? If so, when? Do the plants still need water? If and when should plants be fertilized? 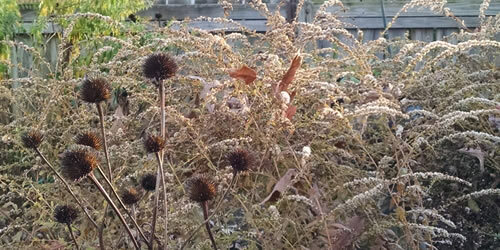 Read on to find some helpful tips for winterizing your perennials. Water is very important. Once temperatures cool off in the fall it is natural to assume that your perennials don't need water. This may or may not be the case and depends on the type of plant, rainfall amounts, and whether or not the a plant has gone completely dormant. True, cooler temps mean the plants do not transpire as heavily as they did during the heat of the summer, but they continue to need water until a hard freeze totally kills off the top foliage of the plant. Non-Dormant Perennials - During the fall, in the absence of rainfall or irrigation, perennials that still have some green, living foliage if perennials still have some green, living foliage might require some supplemental irrigation. In the absence of rainfall or irrigation, give your perennial plants a good deep soaking every week or so, or enough to keep the soil damp, but not constantly soggy wet. The best way to check whether or not your plants need water is to touch the soil around the root zone at the soil surface and a few inches down. If it feels moist, do not water. If it feels dry, water enough to soak the entire root mass. Like a good rain, a good soaking will usually last a week or two in fall, depending on the temperatures. Dormant Perennials - Perennials that have gone totally dormant (lost all their leaves or have died back) won't require much if any supplemental water during the winter. That being said, if the soil becomes very dry during periods of prolonged dry weather, it's good idea to deep soak the soil around the roots every two weeks or so, and especially if a hard freeze is forecast. Dry roots are highly susceptible to freeze damage. On the other hand, if there's moisture in the soil it will form an ice sheath around the roots protecting them at 32 degrees F.
Though not necessary, if you want to clean up your perennial garden for winter, most perennials can be cut back after having gone totally dormant, which means all the leaves and stems have turned brown. That said, I and many other perennial gardeners, who don't might the look of dormant perennials, usually wait until late winter to cut plants back. However, if you'd rather cut plants back right after they've gone dormant it's okay to do so. Dormant Perennials - If you are allowing some perennials to reseed themselves, it's a good idea to wait to cut these dormant plants back until you've collected the seed or the seeds have dropped naturally. Otherwise, most perennials that have gone completely dormant (foliage has gone completely brown) can be cut back to the ground or just above the ground. That said, as previously mentioned, DO NOT prune perennial Lantana plants back until new growth begins to emerge in spring. Non-Dormant Perennials - Perennials that still have some green growth and/or are producing flowers should not be cut back until they've gone completely dormant. You can keep these deadheaded until they go dormant. Deadheading simply defined is the removal of spent flowers. A good general rule of thumb for deadheading: if it looks dead, cut it off. Make your cuts just beyond/below the dead part of the flower or stem. The best reason to do this is that the plants (and your gardens) look so much better with all the dead flowers, stems and foliage removed. That said, if there are perennials that you want to produce seed wait to prune until after you've collected the seed. NOTE: If you are unsure as to when and how to prune a specific variety of perennial plant don't hesitate to contact us with your questions. The benefits of mulching your perennial plants with a shredded bark or compost during winter are fairly obvious. It helps to hold in moisture and insulates and protects the roots of plants if and when some seriously cold temperatures come along. Compost or shredded bark (when it decomposes) will also add beneficial organic matter to the soil. Your plants will appreciate this nutrient-rich meal and reward you with better performance during the next growing season. Apply mulch or compost at a depth no more than 1 to 2 inches, for most perennials. Tender perennials, such as elephant ears, can be protected with a heavier layer of straw or shredded wood mulch (4-6 inches) that can be removed in early spring to allow new growth to emerge. During the dormant season no feeding of perennial plants is necessary. In fact, in cold-winter areas you want to discontinue fertilization of perennial plants at least two months prior to the average first-frost date in your area. Where I'm at in central Georgia the average first frost date is November 9th, so I discontinue feeding perennials in mid-September. That said, as mentioned above, a layer of nutrient-rich, aged compost is okay. Where I garden in the South, it's a general rule of thumb to divide spring and summer blooming perennials in the fall and fall bloomers in spring. Keep in mind that the best time to relocate and transplant an established perennial to another spot in the garden is the same as the recommended time for division. If you are unsure as to when to divide a specific type of perennial don't hesitate to contact us with your questions. Some of us grow some tender annual bulbs and tuberous plants such as Caladiums, Dahlias and Gladiolus among the more hardy perennial plants in our gardens. Many of these tender bulbs and tubers can be dug and stored for the winter and replanted in spring. After the first frost has struck, and foliage begins to yellow and die, cut back the foliage, dig, and store tender perennial bulbs. When digging be careful not to damage the underground bulb or tuber. Store bulbs in a paper bag in a cool, dark space. To quickly search the article database you can use the Search Advice box at the top-center of any page on the website. For example, if you want to find articles having to do with planting and caring for Azaleas just type the word "azalea" in the Advice search box and a list of relevant articles will appear. Welcome To Wilson Bros Gardens! Does Wilson Bros Gardens Sell On Ebay? How Far Apart To Space Bamboo Plants For A Hedge Or Privacy Screen? Why Are The Flowers On Autumn Twist Encore Azaleas Blooming Pink Instead of White? When Is The Best or Latest Time To Plant Shrubs & Trees To Avoid Cold Damage? Are There Any Truly Deer Resistant Plants? What Can Cause Flower Buds To Fall Or Drop From A New Plant Or Tree? Why Are The Leaves On My Azaleas Turning Brown or Black On The Tips? How To Make Green, Oolong & Black Tea From Tea Camellia Plants? Why Does Wilson Bros Gardens Offer Only Large Size And Not Smaller Plants? Why Doesn't My Pineapple Guava Tree Produce Fruit? When Is The Best Time To Plant Blackberry & Raspberry Plants? Why Are Some Of The Leaves On My Crape Myrtle Turning Red With Black Spots? How To Save A Sick Or Dying Shrub, Tree Or Other Plant That Is Growing In A Pot Or Other Container? How Long After Planting Does It Take For A Grape Vine To Produce Fruit? What Are Chill Hours For Fruit Plants & Trees?